· Peru has 69 million hectares of forests, the country with the second largest extent of Amazonian forests after Brazil. · The Ministry of Agriculture and Irrigation in coordination with the Ministry of the Environment are joining the Tropical Forest Alliance to promote public-private partnerships for deforestation free agriculture. Davos-Klosters, Switzerland, 24 January 2019 – The Vice president of the Republic of Peru, Mercedes Araoz, announced today at the World Economic Forum Annual Meeting in Davos-Klosters, that it will join the Tropical Forest Alliance (TFA) to work hand in hand with multinational stakeholders committed to accelerating progress for sustainable management of forests and decrease carbon emissions. TFA is a global public-private partnership to drive action towards deforestation-free supply chains, hosted at the World Economic Forum. Peru has approximately 69 million hectares of forests that represent more than half of its territory. Nonetheless, deforestation of Peruvian forests generates 51 % of all greenhouse emissions of the country. To halt deforestation, the Government has presented “Four core strategies to fight deforestation” with the objective to reduce deforestation in the Peruvian Amazon by 30% by 2030. "As the country with the second largest extent of tropical forest in the Amazon, we are conscious of the global importance of forest conservation and of the consequences of climate change for people who live in and depend on forests. Peru has several pilot projects underway with one of the core strategies being sustainable agricultural production. For this reason, the Peruvian Government is joining forces with key national and international actors to reduce commodity-driven deforestation and support sustainable rural development to reduce deforestation linked to supply chains in the country. As a public sector partner of the Tropical Forest Alliance, we hope to catalyse more strategic partnerships,” said Mercedes Araoz, Peruvian Vice President. Reducing tropical deforestation by addressing commodity expansion is a key area of action against global climate change. Peru has the 10th-most-forested area of any country in the world; over half the country—some 260,000 square miles—is covered in trees. This makes Peru one of the most biodiverse countries in the world, with over 330,000 people who depend directly on the country's forests for their livelihoods, and countless more who depend on the numerous product and ecosystem services those forests provide. “It is terrific that Peru, as the world's fourth largest rainforest nation, has joined the Tropical Forest Alliance. Teaming up with leading global agribusiness companies can help Peru reduce deforestation and become a favored investment destination for companies that want to produce commodities free of deforestation.” said Ola Elvestuen, Norwegian Minister of Climate and Environment. The Alliance will support Peru to propel action towards fulfilling the objectives outlined in the Joint Declaration to Reduce Deforestation signed with Norway and Germany, in September 2014, which contribute directly to the achievement of its National Determined Contribution in the Paris Agreement. In this context, the Ministry of Agriculture and Irrigation in coordination with the Ministry of the Environment are promoting public-private partnerships with multinational companies and civil society organizations committed to deforestation free agriculture. “It’s vital that the public and private sectors join forces to protect our forests and we’re delighted that Peru is now joining the Tropical Forest Alliance. The members of the Consumer Goods Forum are working to help eliminate deforestation from the world’s supply chains and we look forward to partnering with Peru in our work, along with many other governments and stakeholders,” said Peter Freedman, CEO of the Consumer Goods Forum. Latin America is a region of great complexity and potential for deforestation-free commodities development. TFA Partners have engaged initiatives in Brazil and Colombia due to the relevance of their natural, political and economic capital. Progress has been made, but more still needs to be done to reach our global climate goals. This rapid deceleration will be possible only if the governments, farm holders, rural and indigenous communities, businesses and civil societies of tropical forest regions devise and implement effective strategies. “By joining the Tropical Forest Alliance, Peru sends a strong signal that the government is committed to partnering with the private sector and civil society towards sustainable production and deforestation-free commodity supply chains. We are thrilled that Peru will champion and work with the TFA community to amplify attention for forests. An improved understanding of the commodities and forest agenda will be essential for building on synergies and minimizing trade-offs between sustainable food production, biodiversity conservation, and livelihoods.” said Justin Adams, Director, Tropical Forest Alliance. 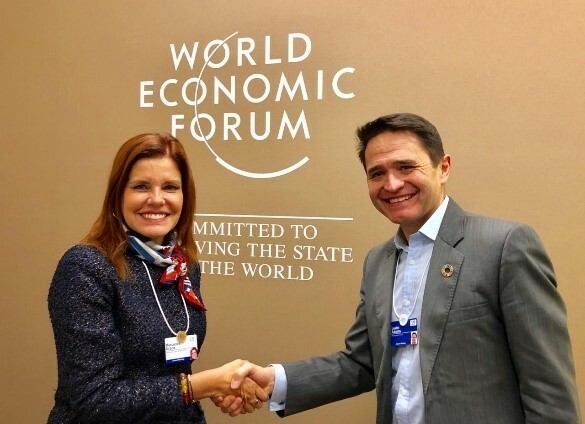 “We are delighted that Peru is joining the Tropical Forest Alliance hosted at the World Economic Forum, adding to the public-private undertakings launched earlier in Colombia and Brazil to further the sustainable management of the Amazonian forests and to decrease carbon emissions, while driving efforts to achieve deforestation-free supply chains.” said Marisol Argueta, Head of Latin America, Member of the Executive Committee, World Economic Forum. The Tropical Forest Alliance counts over 150 the public-private partners with the mission of mobilizing all actors to collaborate in reducing commodity-driven tropical deforestation and to actively engage in advancing the forest conservation agenda. The World Economic Forum Annual Meeting brings together over 3, 000 global leaders from politics, government, civil society, academia, the arts and culture as well as the media. Convening under the theme, Globalization 4.0: Shaping a Global Architecture in the Age of the Fourth Industrial Revolution, participants will focus on defining new models for building sustainable and inclusive societies in a plurilateral world.